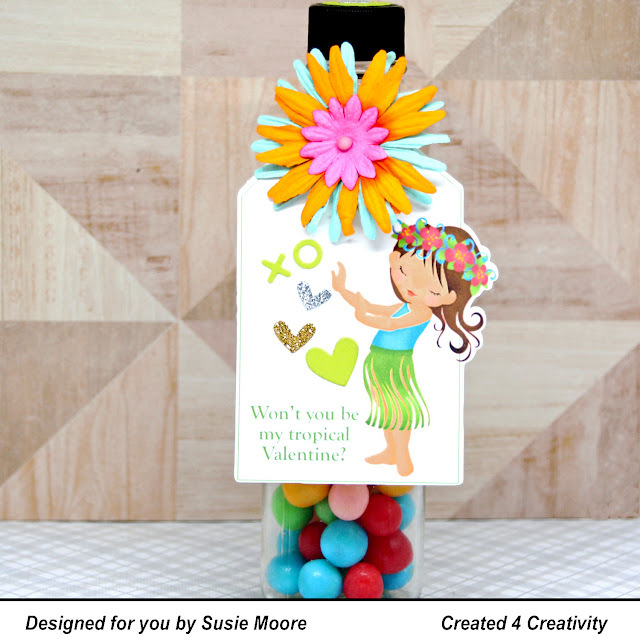 Created 4 Creativity : Won't You Be my Tropical Valentine? Won't You Be my Tropical Valentine? I am heading out today to make some fun art projects with my sweet friends at a local assisted living facility. My friend Jalayne and I go once a month to share some crafty love with them. I usually do a card or a tag or a banner. It's always mostly done for them, but they certainly add their flair to every project I give them! I loaded up some glass bottles with Tropical Air Head candy and then designed my tag using that theme. The little hula girl is a print and cut file from Silhouette which I merged with a tag. I printed it out after tweeking it in Photoshop. Then I cut out pages of them with my Brother Scan n Cut. I went through some old flowers I had and managed to find enough for the tag toppers. The little paper embellishments are die cuts from various companies. I am looking forward to being with my friend Jalayne and also seeing my older friends at the assisted living!